The elderly man had leapt up from his stool on the sidewalk next to Nanjing Road as soon as he saw me pull out my camera. I had thought he was going to warn me not to take pictures; I could spot a security guard a few yards away watching us talk. But the man wanted the exact opposite—he and his neighbors have a message to spread, and they’re so eager to do so that he was asking me (with absolutely no idea who I was) to put photographs of their five-day-old housing protest on the Internet. The man and four women were sitting on the sidewalk this afternoon, facing a wall where a small-scale tug-of-war is being fought. When I had walked past the wall on Saturday, it was filled with black spray-painted characters. Having grown up in Philadelphia, I usually don’t look twice at graffiti. 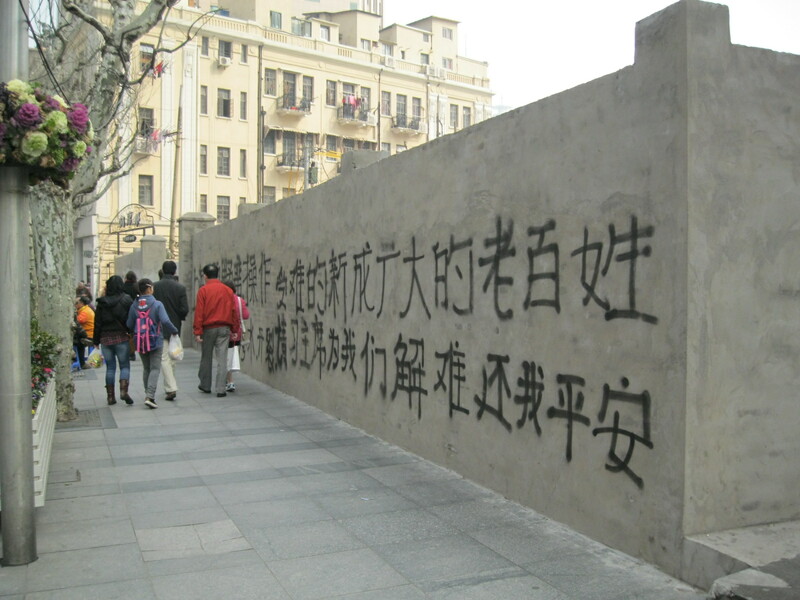 But graffiti isn’t especially common in China, and even less so on Nanjing Road, Shanghai’s most famous street. So I pulled out my camera and began snapping away, getting a vague sense of the message and figuring out that it was a protest of some sort. I wasn’t the only person who saw the writing on the wall: several fellow pedestrians slowed down to read the message as well. I went home and deciphered the text, realizing that the authors of the graffiti were protesting the poor condition of their homes and condemning the behavior of their property management company. When I walked past the wall again yesterday afternoon, I was surprised to see that only a few of the characters had been erased. But by today, that original message had been entirely covered over with a messy layer of gray paint. The group refused to back down, though, and had hung a large sheet with a shorter version of their complaint on it on the wall. This is what I was photographing when the five protestors noticed my interest in their message. … now you don’t. The wall on Saturday (top) and today (bottom). The four women seemed content to remain on their stools and knit, but the man was excited to have an audience and eagerly explained their plight to me. Their eighty-year-old apartments are in poor condition, crumbling and about to be demolished, but the property management company hasn’t compensated the residents with the funds they’ll need to move somewhere else. Some of the buildings in the apartment complex have already been torn down; the man directed me to peer through a hole in the fence so I could see the newly cleared ground, soon (I presume) to be a construction site. 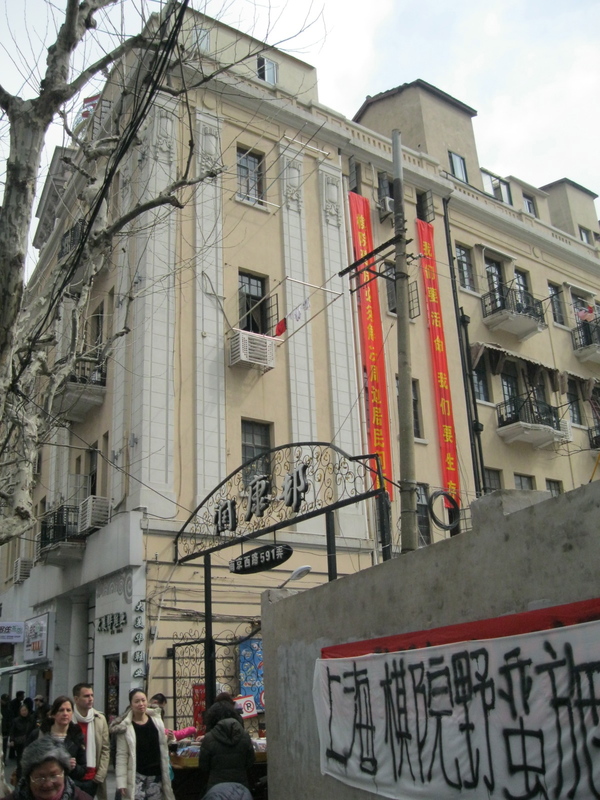 The apartment building where the protestors live, with a glimpse of their banner in the foreground. I asked the man how long he’s lived in the condemned building. “More than sixty years,” he said. “We all grew up here. Our parents bought these apartments.” But he didn’t seem upset by the idea of moving elsewhere, shrugging away my question on that topic with the ubiquitous Chinese expression, “Mei banfa” (literally, “there’s no way/solution,” but more the equivalent of “Whaddya gonna do?”). Instead, they’re angry at the dismissive response they’ve gotten so far from the management company. The elderly protestors will happily move to newer, quieter apartments somewhere else in the city, away from the madness of Nanjing Road’s traffic and commerce, but they want the management company (quite rightly) to pay for what it’s taking away from them. 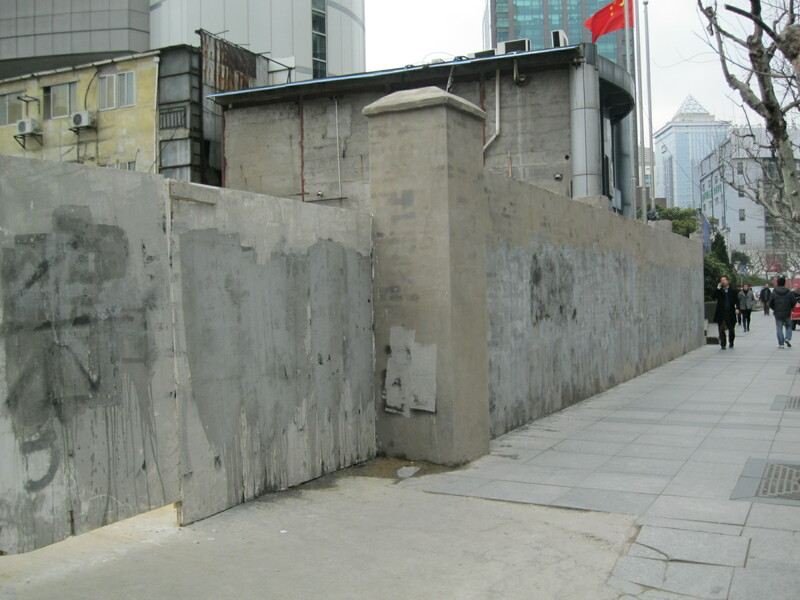 Similar standoffs happen all the time in Chinese cities, where battles over fair compensation for residents forced to move from their homes have become regular occurrences. Sometimes people will refuse to leave, leading to the “nail house” phenomenon that results when demolition crews knock down everything around the disputed house but leave that one standing (a great gallery of photos is here). 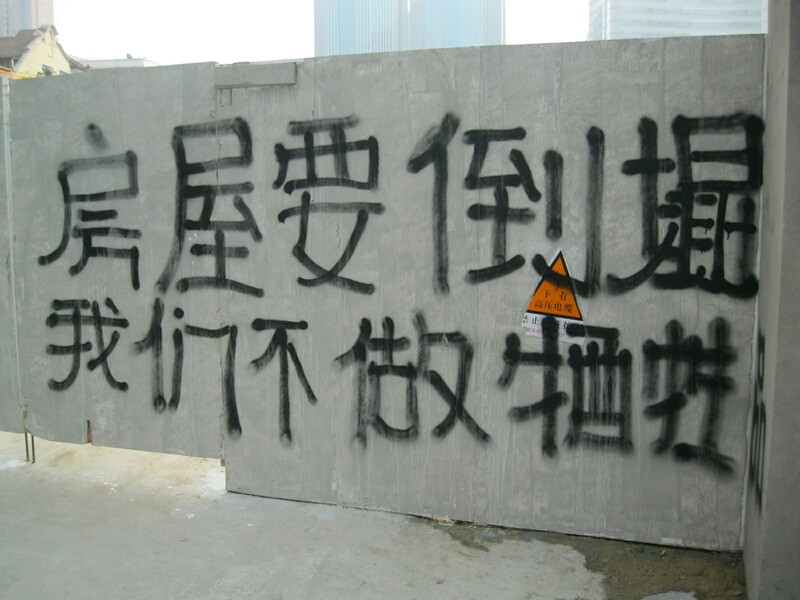 For the most part, the protestors aren’t fighting to keep their homes—they know that’s a losing battle (“mei banfa”). But they do want to ensure that they get the most money they can to buy new apartments and settle somewhere else. I don’t know the exact figures, but Nanjing Road has to be the site of some of Shanghai’s most expensive commercial real estate. A few blocks west of where the protestors live, the street is lined with massive shopping malls, high-end hotels, and bustling restaurants. 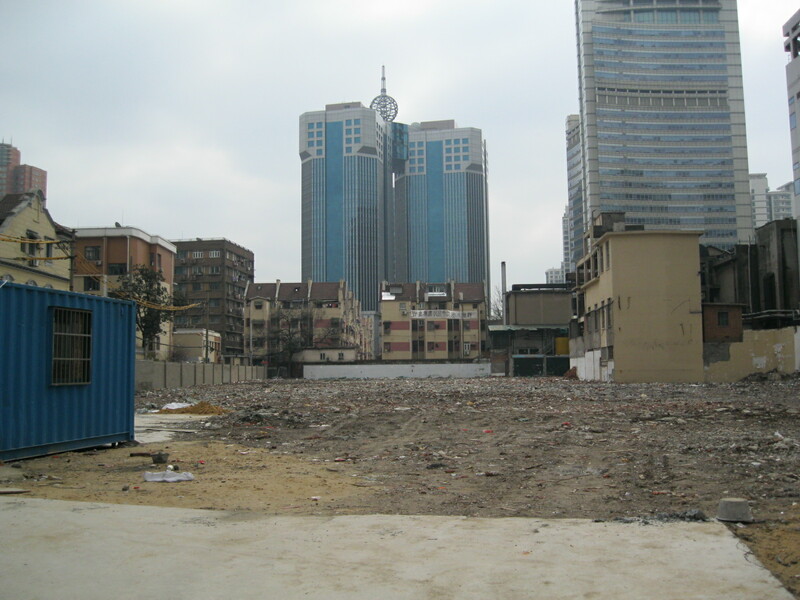 Their section of Nanjing Road is comparatively quiet and under-developed, though that will almost surely change once the old apartment buildings are torn down and the ground is cleared for construction. Lot where apartment buildings have already been demolished. Previous Previous post: Is It Ethical to Travel to North Korea? Maura, this is a great story. I like the idea of a “knitting protest”; I think we should adopt that idea over here. Less marching and shouting–put up your sign and take out your needles and go to town. Thanks for sharing!